Curiously, the Tampa Bay Times recently started reporting the All for Transportation tax hike in Hillsborough County will raise $15.8 billion over 30 years, while they consistently called it at $280 million per year, $9 billion tax before and just after the election. Times publisher Paul Tash has been all-in for Jeff Vinik who bailed out the struggling paper. Now, a TV station is reporting that White plans to go to court to try and stop the three-decade, $15.8 billion tax from ever being collected. Commissioners instructed county staff to start identifying road and sidewalk projects that could get started in 2019 thanks to the new revenue stream the 1-cent sales tax will generate, estimated to be $302 million per year. But in the prior months, they called it a “$9 billion backlog”, or conflated the AFT amendment with the Hillsborough MPO LRTP. But no one has come up with the money for any of this work, or for hundreds of other transportation fixes across Hillsborough County that now add up to some $9 billion. The latest stab at an answer comes from a citizens group backed by business leaders grown weary of inaction by government leaders. They’ve succeeded in landing a proposal on the Nov. 6 general election ballot to raise the sales tax by one cent on the dollar and bring in $276 million a year for road and transit projects.. The 30-year transportation measure will add a penny on the dollar to the sales tax and raise about $276 million per year. Estimates from a long-range plan by the Hillsborough Metropolitan Planning Organization say the 30-year tax would raise about $8 billion in its first two decades. The plan, developed in 2014, does not provide estimates for the final 10 years of the tax. AFT has stated their plan was based on the MPO’s 20-year LRTP. The AFT tax is over 30 years. That should have been the first clue that the Times should not have compared AFT with the LRTP. 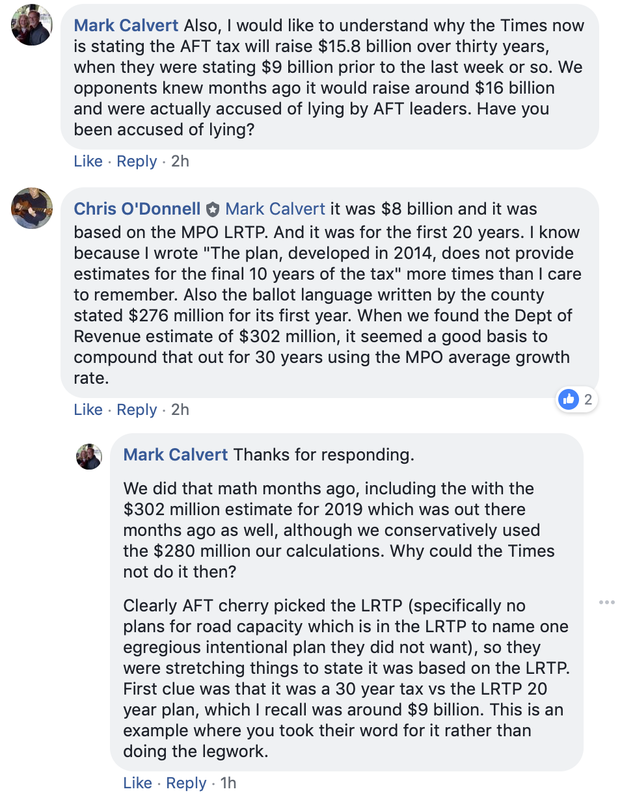 AFT obviously cherry picked their preferred projects from the LRTP for their “plan”, such as restricting funding for new road capacity, while the LRTP had included $1 billion over 20 years. The Times editorial page was even worse. With the tax set to generate $9 billion or more over the next 30 years, it’s essential taxpayers can be assured money is appropriately spent. The one-cent sales tax will generate $9 billion or more over its 30-year life, making a healthy dent in the county’s $13 billion transportation backlog. The tax would generate about $300 million a year, or $9 billion over its 30-year life, taking care of most of the $13 billion backlog in Hillsborough’s transportation needs. They wrote on multiple occasions the AFT tax hike would raise $9 billion over 30 years. All for Transportation was formed by developer Jeff Vinik who “invested” at least $1.5 million into the financially struggling Times more than 18 months ago. Vinik’s $3 billion Water Street project is reportedly not meeting the lender’s benchmarks and in deep trouble. Proximity to a light-rail system might save the project. I recently asked Times reporter Chris O’Donnell about the change on one of his Facebook posts. It was clear when the AFT amendment was published in June it was a 30-year tax. The growth assumptions are well known. They are from the MPO, the same organization whom AFT’s “plan” was based on, as reported on… by the Times. The Florida Department of Revenue estimates that the one percent tax for transportation will bring in $302 million in 2019, $26 million more than the estimate county officials used when they approved ballot language for the initiative. However, the State of Florida published its County and Municipal Revenue Estimates by September, 2018. We were able to confirm the 1 percent tax hike would raise $302 million back in September. Why was the Times unable to find that public information until recently? We had no problem obtaining the accurate facts and figures. We wrote on multiple occasions since June the tax would raise an estimated $16 billion over its 30-year life. The numbers and assumptions were out there, and the math is not difficult. Just using the MPOs growth and inflation assumptions results in $16 billion. 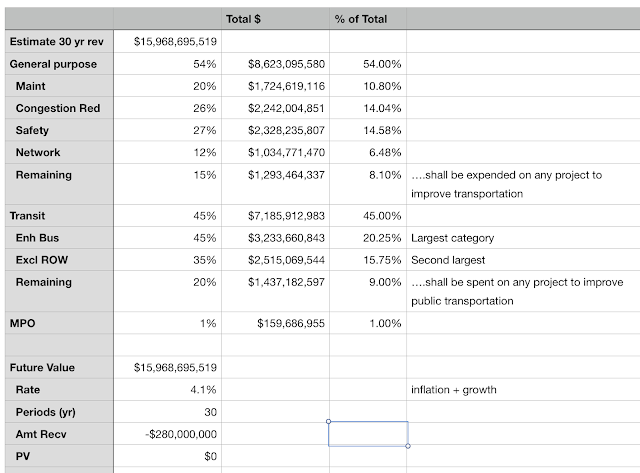 Here’s a screen shot of a spreadsheet we used for the calculations and assumptions months ago, prior to the publication of the 2018-19 County and Municipal Revenue Estimates as well as the AFT spending categories break down. 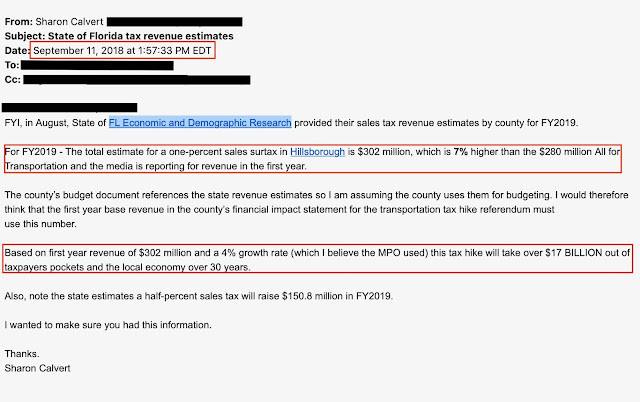 The truth is, starting with $280 million raised in year one, accounting for inflation and growth over the 30 -year lifespan of the tax, the tax will raise an estimated $15 billion dollars using the Hillsborough MPO’s LRTP inflation and population growth factors.You might ask why that $15 billion is never reported. You might ask why that $15.8 billion was never reported until recently. The truth has always been out there. All for Tansportation, Chris O’Donnell, Florida Department of Revenue, Hillsborough MPO, Jeff Vinik, Paul Tash, Stacy White, Tampa Bay Times, Water Street Tampa.